Soap Set -SquareSouthern Surcee - 12-Inch Single Letter FREE with $50 Purchase! Add items totaling $100 or more to your cart. If there is an active coupon and you plan to use it, make sure your order total will be $100 after the discount. Your order total is BEFORE shipping is applied. 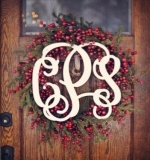 Our 10-inch three-letter monograms are cut from 1/4 birch wood and perfect for interior doors and appliques on furniture. Each of our monograms are cut from UNFINISHED WOOD, ready for paint, glitter or whatever you can imagine. We recommend spray-painting your monograms with several thin coats in the color of your choice. The size of this monogram is the height of the center letter. The width will vary depending on the combination of letters.